The word "truck" might have come from a back-formation of "truckle" with the meaning "small wheel", "pulley", from Middle English trokell, in turn from Latin trochlea. Another explanation is that it comes from Latin trochus with the meaning of "iron hoop". In turn, both go back to Greek trokhos (τροχός) meaning "wheel" from trekhein (τρέχειν, "to run"). The first known usage of "truck" was in 1611 when it referred to the small strong wheels on ships' cannon carriages. In its extended usage it came to refer to carts for carrying heavy loads, a meaning known since 1771. With the meaning of "motor-powered load carrier", it has been in usage since 1930, shortened from "motor truck", which dates back to 1916. In the United States, Canada and Philippines "truck" is usually reserved for commercial vehicles larger than normal cars including pickups and other vehicles having an open load bed. 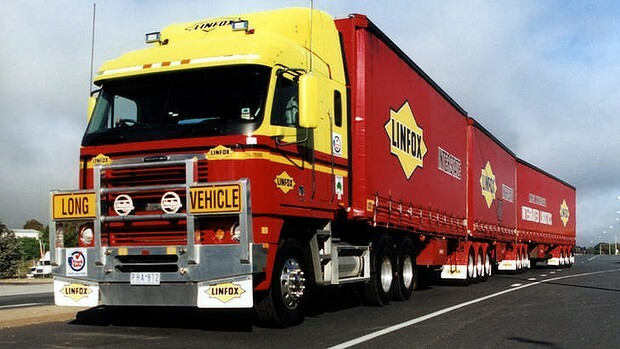 In Australia, New Zealand and South Africa, the word "truck" is mostly reserved for larger vehicles; in Australia and New Zealand, a pickup truck is usually called an ute (short for "utility"), while in South Africa it is called a bakkie (Afrikaans: "small open container"). In the United Kingdom, India, Malaysia, Singapore, Ireland and Hong Kong lorry is used instead of truck, but only for the medium and heavy types. In Australia and New Zealand, the term ute (short for coupé utility) is used to describe a pickup truck with an open cargo carrying space but a front similar to a passenger car, and which requires only a passenger car license to drive. The concept was developed in 1933 by Lewis Bandt of the Ford Motor Company in Geelong following a request from a Gippsland farmer's wife for a vehicle that they could go to church in on Sunday without getting wet and also use to take the pigs to market on Monday. MR: Medium rigid: a rigid vehicle with 2 axles and a GVM of more than 8,000 kilograms (17,637 lb). Any towed trailer must not weigh more than 9,000 kilograms (19,842 lb) GVM. Also includes vehicles in class LR. HR: Heavy Rigid: a rigid vehicle with three or more axles and a GVM of more than 8,000 kilograms (17,637 lb)). Any towed trailer must not weigh more than 9,000 kilograms (19,842 lb)) GVM. Also includes articulated buses and vehicles in class MR.
MC: Multi Combination e.g., B Doubles/road trains. There is also a heavy vehicle transmission condition for a licence class HR, HC, or MC test passed in a vehicle fitted with an automatic or synchromesh transmission, a driver’s licence will be restricted to vehicles of that class fitted with a synchromesh or automatic transmission. To have the condition removed, a person needs to pass a practical driving test in a vehicle with non-synchromesh transmission (constant mesh or crash box). In 2006 the U.S. trucking industry employed 1.8 million drivers of heavy trucks. There are around 5 million truck drivers in India. The cab is an enclosed space where the driver is seated. A "sleeper" is a compartment attached to the cab where the driver can rest while not driving, sometimes seen in semi-trailer trucks. 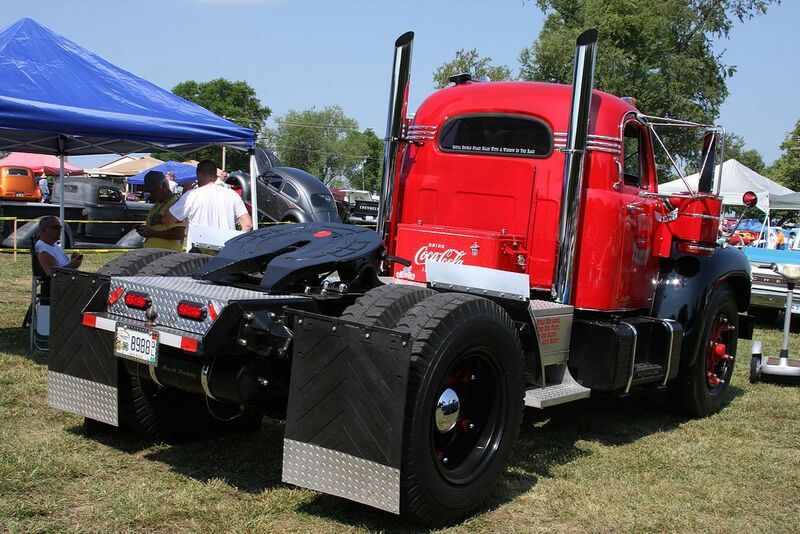 "Cab over engine" (COE) or "flat nose"; where the driver is seated above the front axle and the engine. This design is almost ubiquitous in Europe, where overall truck lengths are strictly regulated, but also widely used in the rest of the world as well. They were common in North America, but lost prominence when permitted length was extended in the early 1980s. To access the engine, the whole cab tilts forward, earning this design the name of "tilt-cab". This type of cab is especially suited to the delivery conditions in Europe where many roads follow the layout of much more ancient path, and trackways which require the additional turning capability given by the short wheelbase of the cab over engine type. The COE design was invented by Viktor Schreckengost. Conventional cabs are the most common in North America and Australia, and are known in the UK as "American cabs" and in the Netherlands as "torpedo cabs". The driver is seated behind the engine, as in most passenger cars or pickup trucks. Conventionals are further divided into large car and aerodynamic designs. 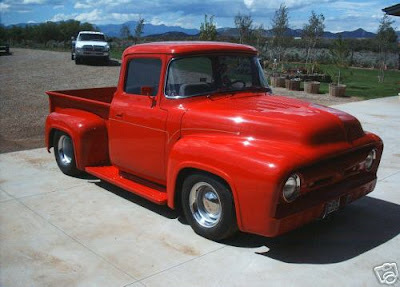 A "large car" or "long nose" is a conventional truck with a long (6-to-8-foot or 1.8-to-2.4 m or more) hood. "Aerodynamic" cabs are very streamlined, with a sloped hood and other features to lower drag. The oldest truck was built in 1896 by Gottlieb Daimler. Most small trucks such as sport utility vehicles (SUVs) or pickups, and even light medium-duty trucks in North America and Russia will use petrol engines (gasoline engines), but many diesel engined models are now being produced. Most of the heavier trucks use four stroke diesel engine with a turbocharger and aftercooler. Huge off-highway trucks use locomotive-type engines such as a V12 Detroit Diesel two stroke engine. Diesel engines are becoming the engine of choice for trucks ranging from class 3 to 8 GVWs. North American manufactured highway trucks almost always use an engine built by a third party, such as CAT, Cummins, or Detroit Diesel. Small trucks use the same type of transmissions as almost all cars, having either an automatic transmission or a manual transmission with synchromesh (synchronizers). Bigger trucks often use manual transmissions without synchronizers, saving bulk and weight, although synchromesh transmissions are used in larger trucks as well. Transmissions without synchronizers, known as "crash boxes", require double-clutching for each shift, (which can lead to repetitive motion injuries), or a technique known colloquially as "floating", a method of changing gears which doesn't use the clutch, except for starts and stops, due to the physical effort of double clutching, especially with non power assisted clutches, faster shifts, and less clutch wear. Trucks contribute to air, noise, and water pollution similarly to automobiles. Trucks may emit lower air pollution emissions than cars per equivalent vehicle mass, although the absolute level per vehicle distance traveled is higher, and diesel particulate matter is especially problematic for health. With respect to noise pollution, trucks emit considerably higher sound levels at all speeds compared to typical car; this contrast is particularly strong with heavy-duty trucks. There are several aspects of truck operations that contribute to the overall sound that is emitted. Continuous sounds are those from tires rolling on the roadway, and the constant hum of their diesel engines at highway speeds. Less frequent noises, but perhaps more noticeable, are things like the repeated sharp-pitched whistle of a turbocharger on acceleration, or the abrupt blare of an exhaust brake retarder when traversing a downgrade. There has been noise regulation put in place to help control where and when the use of engine braking retarders are allowed.